My sense is that people used to talk about Austin Hedges more. I don’t know if that’s actually true, but I can’t imagine I’m about to be fact-checked. Hedges has long been considered a quality catcher prospect, far more for his defense than for the potency of his swing. By receiving, by game-calling, by throwing, Hedges was among the prospect elite. At the plate, he drew a few too many comparisons to players like Drew Butera. And so the reputation was cemented — Hedges could field, and do nothing else. It’s difficult for any player to change a reputation. Prospect reputations, however, probably shouldn’t be all that sticky. Hedges, at this point, is in line to be the starting catcher for the Padres, and last season, he did the damnedest thing. It would appear that Austin Hedges just learned how to hit. The differences evident are stark. Hedges, last year, started to drive the ball, and put the ball in the air more often. He more than doubled his previous isolated power, although there are two things I need to point out. One, yeah, we’re talking fewer than 400 plate appearances. And Hedges spent most of the year in Triple-A El Paso, which is a hitter-friendly environment. There’s little question that Hedges’ most recent performance is somewhat statistically inflated, but that doesn’t mean there’s nothing to be excited about. Power is power, and from the looks of things, Hedges added to his skillset. I’ve kept in mind what Kiley McDaniel wrote about Hedges at the end of 2014. Back then, of course, there were concerns about the bat, but Kiley identified a fair amount of power potential. Additionally, there was talk that Hedges hadn’t focused too much on his offense, because catching comes with so many other responsibilities. This is why catchers tend to develop at the plate a little later, so Hedges’ path wouldn’t be too unusual. What’s happened goes in line with what Kiley wrote, although it’s been a better outcome, perhaps, than the Padres could’ve expected. Hedges just needs to take it all into the majors. Below, you can see two spray charts, courtesy of MLB Farm. 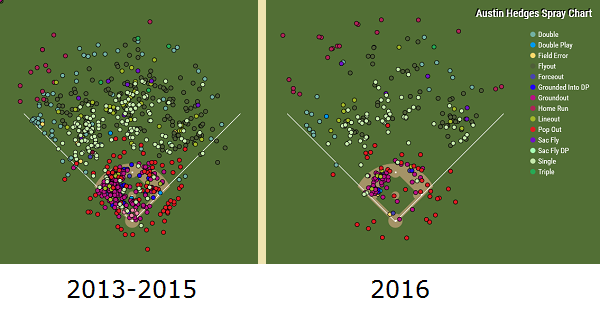 On the left, Hedges’ batted balls from between 2013 and 2015. On the right, 2016. These things are never too easy to compare side-by-side, but you can see increasing variety in Hedges’ power. There are still pop-ups — Hedges is going to hit pop-ups. But there are some homers to right, and homers back up the middle. There’s reduced grounder action in the infield. The guy on the left has opportunistic pop, whereas the pop on the right looks more legitimate. Hedges credited (coach Alan) Zinter for helping him create more separation in his upper half during his swing. “For me, it’s getting to what (Zinter) calls the ‘launch position,’ which is basically the strongest position you can be in right before you make your first movement forward to attack the baseball,” Hedges said. “I think I was kind of hindering myself a little bit in not using my entire body and my swing allowing myself to have the maximal amount of room for error and power as well. … If I can get myself to that position, I basically put myself in a better position to succeed. 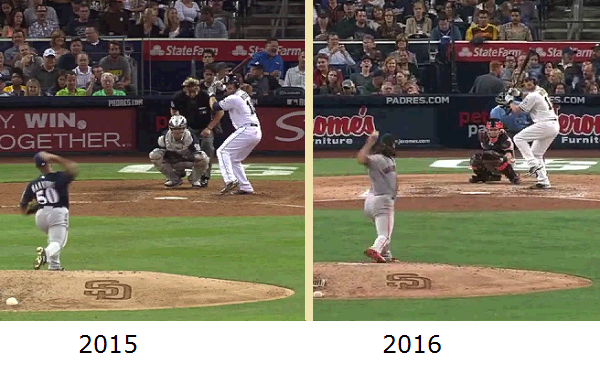 When the pitchers are at their release points, you can see that 2016 Hedges has his hands lower, with the bat more upright. But the most conspicuous change is in Hedges’ leg kick, which used to be gentle, sort of a barely-there maneuver. Last year, the leg got more aggressive, allowing Hedges’ to derive more strength from his lower body. You know what’s a strong part of a person? The lower body! I don’t mean to over-simplify a very complicated task, but the hitter on the right here just looks like more of a threat. Where Hedges used to move forward into the ball, now he drives forward into the ball, with a more powerful approach we’ve seen various big-leaguers adopt over the years. Travis just wrote the other day about hitters trying to get off the ground by changing their swings, and perhaps Hedges belongs on the list of success stories. He at least fits the trend; Hedges worked to get more consistent lift. The results have so far only shown up in a hitter-friendly environment in Triple-A, but even that would represent progress. This different Hedges still isn’t an outstanding offensive player. He swings and misses, and he’s awfully aggressive, meaning you can wonder about his discipline. Maybe he has to grow into that. Maybe this just is what he is. It’s yet to be seen how much of the new power MLB ballparks are going to swallow. But perhaps Hedges will be a similar hitter to Mike Zunino. Maybe he’ll resemble Wilin Rosario, and his .306 OBP with Colorado. What’s important is that the Austin Hedges of today has developed an actual offensive skill, to go with defensive abilities that rate him among the best in the game. Hedges was a quality catching prospect before he could hit. The player he’s become could turn into one of the Padres’ franchise building blocks. We hoped you liked reading Austin Hedges Learned How to Hit by Jeff Sullivan! That’s odd. I met three tourists from Burkina Faso who said they’d heard of him.